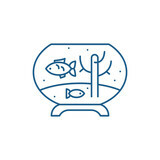 Fish in the aquarium line concept icon. 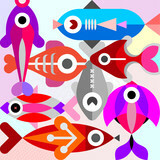 Fish in the aquarium flat vector website sign, outline symbol, illustration. Male worker in aquarium shop feeding fishes. Colony of swiming sea or aquarium fishes. Group of silhouttes . Siamese algae-eater in freshwater aquarium. Crossocheilus oblongus.